The latest release from Upper Deck Gallery is a tribute to Quentin Tarantino, the award-winning filmmaker best known for his satirical storylines, eclectic soundtracks, stylized depiction of violence and references to popular culture. Kill Bill Grindhouse brings together the 70’s style martial arts films that Kill Bill Vol 1 is famous for; including strong female leads wielding very dangerous weapons, and the 2007 American horror film double-feature, Grindouse. The striking 24” x 36” lithograph depicts the Bride surrounded by her would-be assassins including O-Ren Ishii, Vernita Green, Elle Driver, and Gogo Yubari. An Inkan-style “Kill Bill” stamp and kanji text add to the give the viewer a sense of Japanese culture, where much of the movie takes place. 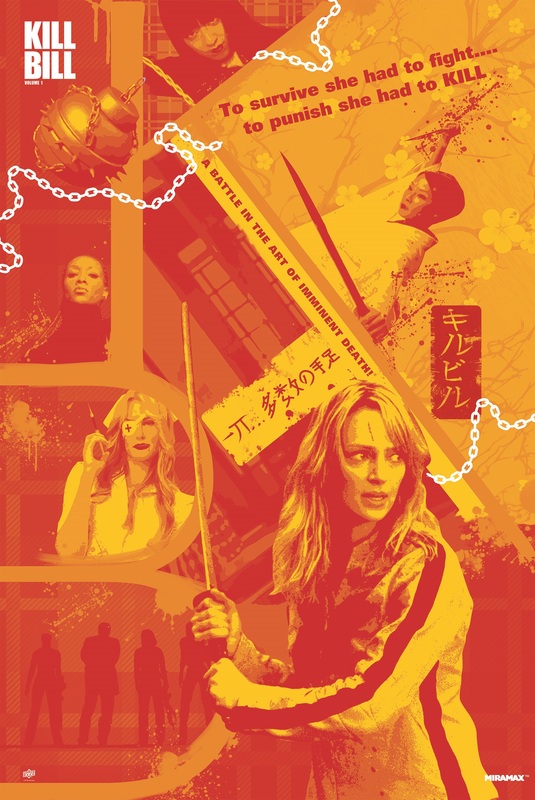 Hand numbered and limited to only 250, the new Kill Bill Grindhouse poster is available for $49.99 exclusively at www.UpperDeckGallery.com while supplies last. Prints are hand numbered to 250 and come with a Certificate of Authenticity. In addition, a variant version features a sophisticated orange and gold color shift. The variant edition retails for $79.99 and is limited to just 100 prints.